"I loved Lady Bound because it helped me to learn and grow into the person I am today. I loved that I knew I could go somewhere if I needed help or advice. I also liked the cool activities, the communiy service projects, fun field trips and sister circles. We had wonderful advisors. Lady Bound was like my second home." Amari is a 11th grader at McEachern High School outside of Atlanta, Georga. She is an active member in the Marching Band, Concert Band, Lacrosse team, and Shop with a Indian (SWAI). "If it weren't for Lady Bound, I wouldn't have gotten through high school. I was left back for bad grades and I wasn't motivated. Mrs. Calwise would tell me she knew I was smart, that I could do anything I put my mind to." Tyler graduated from John Hay High School in June 2012. She is a sophmore at the University of Cincinnati. She is majoring in Biology. Iyanna is a 10th grader at Collinwood High School. She is a member of the basketball, volleyball and track teams. She is also an active member of the JROTC. "I loved Lady Bound. It was fun to meet new friends and participate in the Summer activities. Our retreats and out of town field trips were awesome. We learned, bonded and had fun." Reagan is a 10th grader at Euclid High School. She is a member of the Stand Up student leadership group. She is also an Honor Roll student who is taking college level English Literature classes after school. "I miss Lady Bound because I had a great experience to explore new surroundings. It helped me develop skills to be a smart, strong, independent young woman. I liked the lessons that were taught to help us better ourselves. It made me want to succeed." Trinity was a member of Lady Bound for the 2011-2012 school year. She has since transferred to a new school district, but wanted to share her reflection of her experience. helped me become a wonderful young lady. It made me the person I am today, and I thank Mrs. Calwise and my Lady Bound sisters for that." 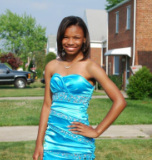 Davonna Marie McDaniel is a 11th grader at John Adams High School in Cleveland, Ohio. She is a member of the track team, Merit Roll honoree and a good citizen. Davonna was chosen to be one of twenty 10th graders to attend college tours sponored by her school. "I love Lady Bound. It kept me safe and made me feel like I was apart of something special. Lady Bound showed me that I didn't have to change for anyone; that I could be myself. I didn't have to be anyone else for someone to like me." Zakkiyah is a 10th grader at the Cleveland School of Performing Arts. She is a performing arts and dance major who is a member of the volleyball team and an Honor Roll student. Zakkiyah aspires to attend Julie Ard Performing Arts School in New York City, New York. If you know Zakkiyah, you know that she WILL achieve this goal! She has more talents than we can count!